This professional 36 Cue firing module perfectly integrates the FireStorm Firework Firing System. 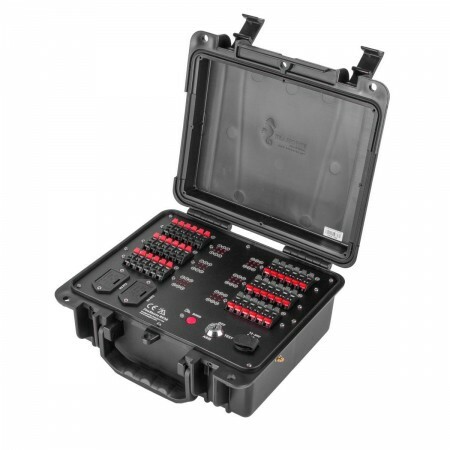 Ideal for use with our TX2 Scripted Control Desk and and FireStorm Audio Player for high cue count pyromusical firework shows. Lower cost-per-cue compared to the 18 Cue Module. Easier to set up for larger shows as there are less modules. Same simple, reliable operation as the 18 Cue Module. Mix and match with all other FireStorm system components. Same rugged construction as the 18 Cue Field Module. Integrates perfectly with the other FireStorm Firing System components. Run from internal 2 x 9V batteries or external 12-24V power supply of your choice.